Not, somewhat disappointingly, objects that are literally floating (although that is a great idea for a show), but rather metaphorically so: the idea is of being unmoored, cast adrift on a sea of uncertainty and ambiguity, washed up on to occasional islands of conceptual terra firma. What this actually means, in practice, is work that’s very much in thrall to 1960s postminimalist and antiform art – a sort of playful. Tactile, formalist aesthetic, which seems to be undergoing something of a revival among younger artist at the moment. 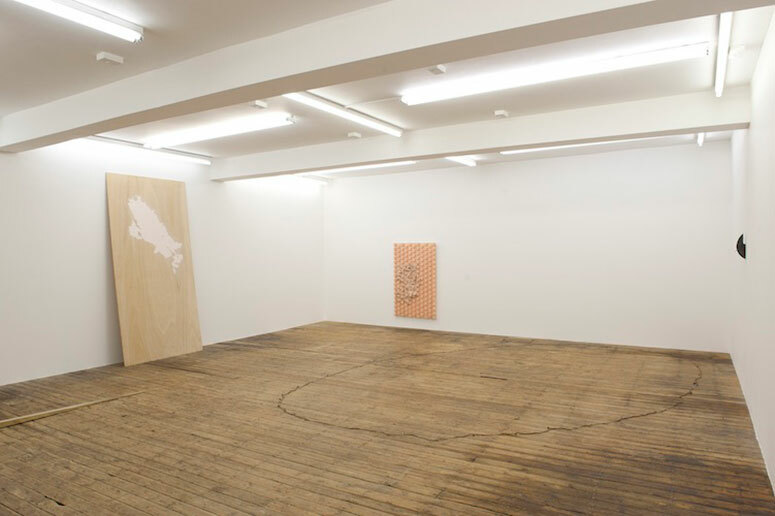 This show, in an absolutely tiny gallery space, is one of the best recent examples. The standout here is Richard Clements, his floor pieces striking a nice balance between formal investigation and the sense of something more ritualistic and fetishized: a long, shiny, brass object, its opposing ends thinning to sharp wedges, but along different axes, has a twisting, unbalanced feel, while a large, loosely drawn circle is made from what turns out to be a continuous cut of fish skin. Also rather affecting is Esmeralda Valencia Lindstrom’s work, with its atmosphere of concentrated meaning somehow leaking away, as in her tightly rolled stub of a lottery ticket surrounded by an abstract lake of hardened, pinkish paint, and Justin Brown’s abstract wall-sculpture, which has the opposite effect, its mechanoid forms suggesting a utilitarian, functional significance. The other two artist’s work, focusing on notions of regular verse irregular forms, perhaps veer slightly too much towards the illustrative: Eoin Donnelly’s cuboid grid that’s clogged with messy, fecaloid clay, and Thomas Down’s rectilinear latticework of steel struts, one of which slopes oddly out of kilter. Overall, though, the show offers a view of an upcoming generation of artists that, with its sense of seriousness and subtlety, leaves you feeling rather buoyant.